"Artist's incredible murals transform kids' rooms into Hogwarts, Disney castles, jungles and deep space"
"Thank you @sacredart_murals for Lyla's new bedroom painting on her wall... We absolutely love it! She will make many happy memories playing in here with her friends. I keep going in there just for a peek, I think we may swap bedrooms with the baby now :) We are so pleased.. Really recommend anyone who wants this done it's very much worth every penny". 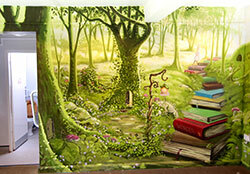 "We are Lydeard St Lawrence Primary School [Somerset], and this summer, Neil Wilkinson Cave magically transformed our school library with the beautiful literary themed woodland mural that you see pictured. Neil is incredibly talented and you should not hesitate to get in contact with him if you have a school, community or even personal space that you would love to transform. I would recommend him one hundred times over - you really should get in contact with him if you even have a seed of an idea about a space you'd like to change! The children at our school love the library mural. It actively draws them to the library and there is something very peaceful and calming about being surrounded by the painting. It has gone from being a bland beige boring room, to the literary heart of the school. We are so very, very proud that our school has this wonderful feature. It will have lasting impact for many generations of children attending this school, an image etched in their memories of a creative learning environment. Neil was totally brilliant to work with. He was able to draw out the exact vision that we had for our woodland theme. When we received the original sketch from Neil, it was totally spot on in terms of what we wanted - in fact it was better than we could ever envisage! Neil was very professional throughout the process and supplied designs and dates for the painting with quick turnaround. In just two weeks he transformed the space. His rates were very reasonable and he worked so hard on this fabulous painting for us. He is such a nice chap and very approachable. 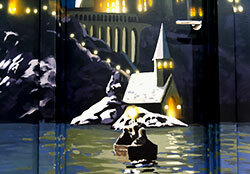 He has done such a fantastic mural for our school, that I have recently asked him to paint another commission for me. Please, don't have any doubts, get in touch with Neil. He's brilliant!"